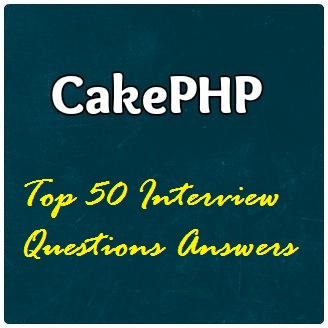 Are you searching for the cakephp interview questions and answers? PHP Dev Zone is publishing the Top 50 basic interview related CakePHP questions and answers. - The Security.salt is used for generating hashes.we can change the default Security.salt value in /app/Config/core.php. - The Security.cipherseed is used for encrypt/decrypt strings.We can change the default Security.cipherSeed value by editing /app/Config/core.php. It loads full application before it starts your task. It's not recommended for small projects because of its resource-heavy structure. How to include helpers in controller ? $this->set('posts',$posts); in controller fie, then the variable $posts will be available to use in the view template file for that action. An advantage with first case $this->set('posts', $posts); is that it allows two different names for the view file and controller file. For example, you could write something like $this->set('postData', $posts);. Now the variable name in the view file would be $postData. It's an automatic task that is done by cakephp. default extension of view files is '.ctp'. yes we can change it by writing public $ext = '.yourext'; in AppController.If you want to change it for particular controller then add it into that controller only.You can also change it for the specific action of the controller by putting it in that action of controller. To learn more about CakePHP, start reading our CakePHP Tutorials Series.